I promised to tell you what happens in my garden. I did not expect this. You might know that automatic cars propel themselves forward (and in my case backwards) without using the accelerator. It’s best to have a driver. The chip van comes to the village on Thursdays. At six in the evening I was to make my weekly contribution to the table by driving down. It was dark and after a a decent day a frost had suddenly descended. Not that I had noticed. 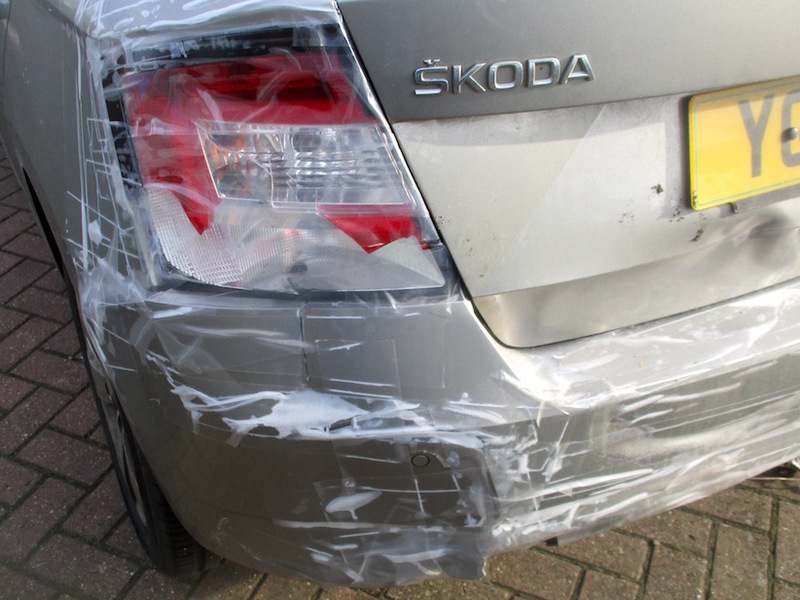 Lights on, into reverse, window wipers previously left on swiped a frosty window. I am always so careful not to activate stuck windows! Minor panic. I hop out of the car to scrape the screen. The car starts to move! In normal circumstance I could have swiftly hopped back into the car (not that I make a habit of these things). 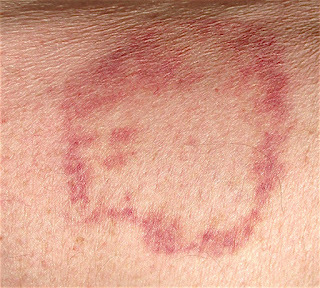 Unfortunately as I lurched back to the car I slipped on the frosty surface and fell horizontal. As I desperately stretched my arm to push down the foot brake the ascending momentum pushed it away. I am note sure I would have caught it had a wall not got in the way. I have pieced this together. I was all in a daze. We got no chips that night, nor could I have eaten anything at all. It was only two hours later that I found I had a bump on my head. Next morning I realised my wrist was sprained and it was all of five days before I discovered three glorious black patches at the top of my leg. As to the wall we lost a yard and will not replace it. 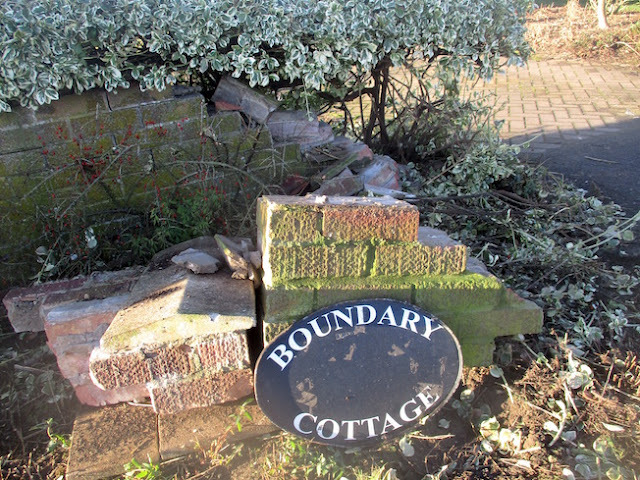 The euonymus was crushed but still standing. I anxiously await its regeneration and have straightened and strengthened it with bamboo canes. In ten weeks there will little sign of my misdemeanour (I hope). Don’t ask about the car! It was quite a mess but fortunately only at the rear left hand corner. Everything still worked albeit substantial bodywork needed fixing. Peter came to the rescue to seal up the broken glass light cover just above the severely dented corner. He has wonderful thick broad water resistant sellotape which he buys from East Riding Horticulture to seal up his large poly-tunnel. I am sure he will bang the table. 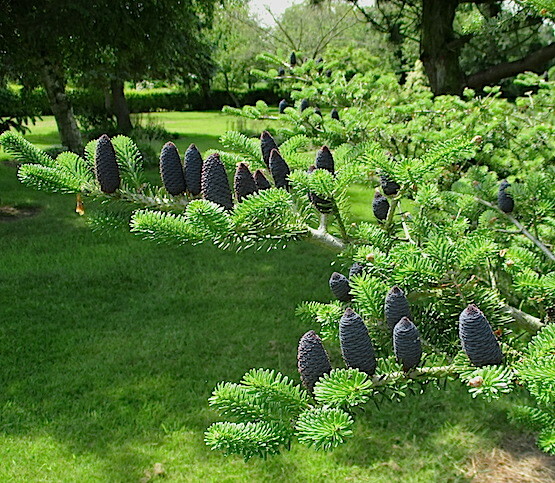 The golden dawn redwood had grown almost two metres last year alone and had given us twelve years of pleasure. The copper beech was lovely and had been brought as an eight foot self sown sapling fifteen years ago from Bolton Percy cemetery garden where even then it had outgrown its position. 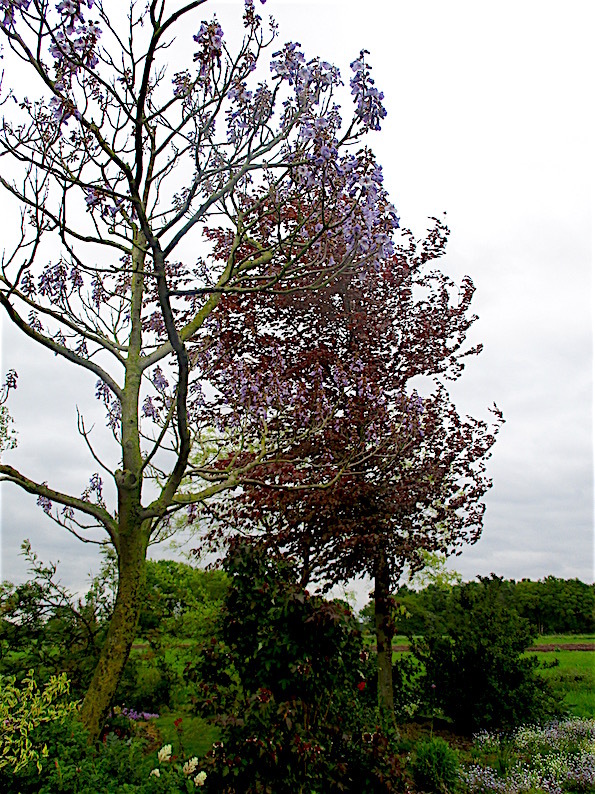 I have hopes for the Paulownia. I read that in its natural habitat it suckers up after forest fires and as every gardener knows when cut back on an annual basis it makes prodigious new growth and magnificent bold leaves. Apparently paulownia is one of the very few trees that photosynthesises by the super fast C4 carbon pathway which has had so much publicity recently with regard to crop breeding. The ironic thing about my tree was that the potentially magnificent blue hollyhock flowers escaped April cold only once in fifteen years - and no-one looked up to notice. 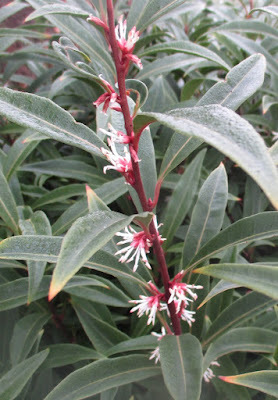 Most gardeners will tell you that it’s a good idea to plant a sweet smelling Winter plant close to the door. Brenda goes further - very much further. Every special plant I have should also be close to the door. If I took notice of her the rest of the garden would be empty. 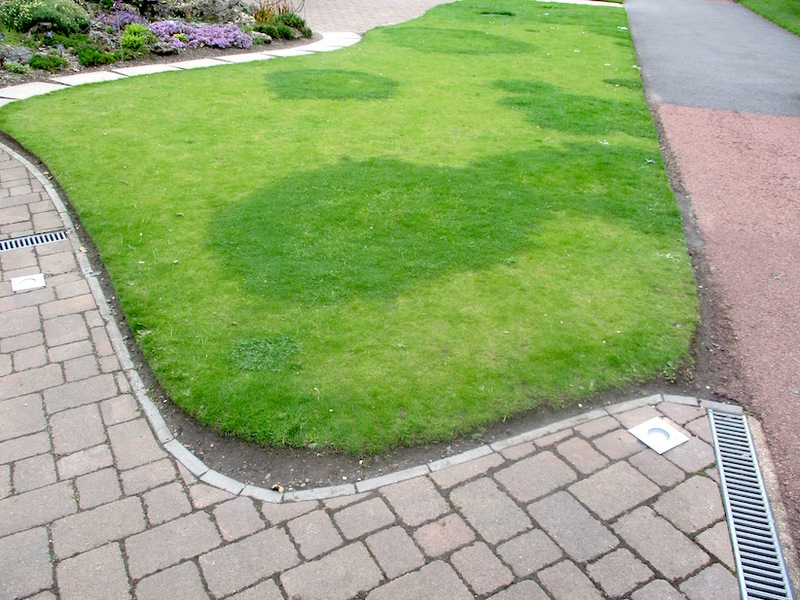 AlthoughI I have written about many aspects of lawn management such as using iron sulphate for its multiple benefits, the application of fertiliser and my love of fescues I have never written about lawns ‘in the round’ - or whatever shape it may be. It’s such a huge subject and although I expend an extra-ordinate appoint of energy on my lawn, as I look out it’s nothing to write home about. Lawns are dear to many gardeners’ hearts and with so many habits dearly held and ingrained, do I dare add my own notions? When I look out on Cathi’s very large very acceptable lawn I wonder why I bother? It’s a minimalist haven. She even drives over it to get to her door. For her half acre she employs Andrew to bring his drive-on rotary mower weekly in Spring. Summer and Autumn but never in Winter. (In contrast I once mowed my own lawn on Christmas day). He cuts the grass quite low but does not scalp it. All the mowings are let fly. A lovely backcloth to.... everything! 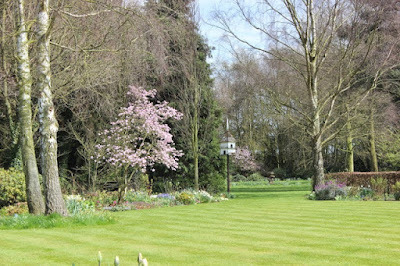 There are no edges, Andrew just cuts up to the shrubs, trees and borders and where necessary mowing plants that wander. In turn when I spray Cathi’s borders, grass that has strayed is sprayed. I also spray out the bases of the shrubs and the trees that stand in the grass. Four years ago I did MCPA spray out her daisies, buttercups and plantains. Cathi is happy with the few wild flowers and loves clover that remains. The lawn receives zero fertiliser. 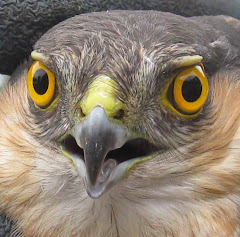 She does fret about the moles and with limited success traps are put down and the mole hills are cleared. Just about the only date from college I remember is 1830 when Budding invented the lawn mower. How did we manage without them? 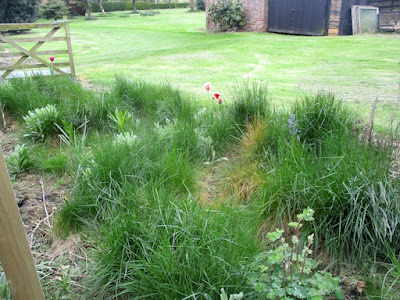 We are hugely dependant on technical developments yet every lawn I see gets something different. Sports turf and its management has had huge resources thrown at it reflecting from early times sport’s commercial importance. Today we amateurs are lucky to share with professionals a huge spin off in knowledge, equipment, grass breeding and selection, fertilisers, weedkillers and management. We can drink at this font but beware some of professional methods are very focussed on their own specialisms and also that although huge sums of money are spent on turf research, professional advice and hugely expensive machinery they too are suckers to snake oil salesman. I once was involved in teaching a full time course on turf management and also delivered day release instruction for groundsmen. What lovely people, some of the nicest students I knew. Some would later go on to huge responsibilities at great golf courses and sports fields. Some gardeners (usually golfers) I know pester such people for advice on their lawns. Many groundsman hold their head high as lords of their realm. A few are little dictators. Some are at the mercy of amateur ‘experts’ who know all the answers and who at home tend their lawns. Grounds people often carry huge turf management - and hence financial responsibilities - on the golf course its a disaster if your members cannot play. Quite out of proportion to groundsmen's pay scale. Far too often golf courses take very expensive expert advice on what are major decisions. The groundsmen usually already know the answers but why take the blame? Please excuse my prattling. I am starting an intermittent series of posts about how we look after our lawns. Today I concentrate on mowing which arguably is the most significant lawn maintenance of all. Grass cut too hard quickly goes yellow. Those who do so might imagine they have a bowling green but that illusion lasts no longer than five minutes. The best formula to achieve yellow sick weedy mossy grass is to let it grow long and then cut it hard! If you wish to have short green healthy grass you need to cut it little and often. Almost every day in Summer might be the appropriate frequency for very closely mown bowling greens; that is is too much for we gardeners. When I used to cut my own lawn relatively close I did so as often as every five days. I now opt for less often but cut the grass higher. I know some gardeners hate mowing so much they leave it as long as possible. If only they would realise that if they did it more often it is so much quicker and easier. Let it get too long and you will certainly need to box off all those mowings perhaps doubling the toil. What a chore. You can have very acceptable lawns with infrequent mowing strategies. The formula is simple - the less often you mow the higher you cut. Much against my former prejudices I must tell you that some modern cultivars of ryegrass make excellent swards when cut at an intermediate height perhaps every two or three weeks in a typical Summer. As every gardener knows you might relax mowing frequency when drought conditions prevail. Raising height of cut helps keep grass green at this time. Remember if you pay a gardener to cut regularly you should take the rough with the smooth. Do not pay him off in dry periods and yet expect him to slave away after wet weather. There is no correct answer as to whether you should or you should not box off your mowings. Most of my life I have left my mowings scatter. Two wives have suffered grass leaves trod into the house. One remains. I am not sure whether I am untidy, lazy or frugal! 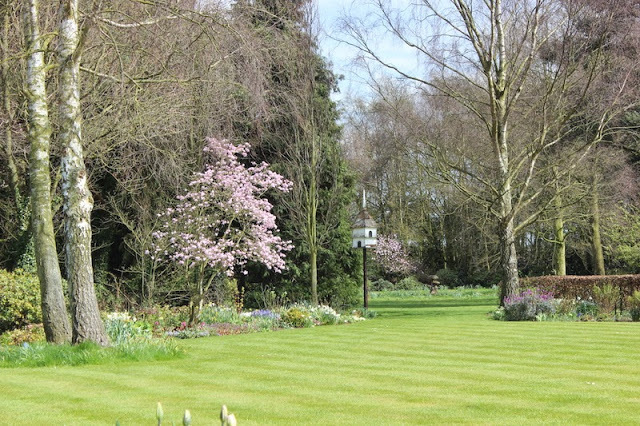 The most immaculate lawns like those of my friend Peter Williams are boxed free of their leaves. Some gardeners compromise and in their rougher more distant areas only there let the grass fly. Where leaving the leaves loses is where grass is cut hard and long. It can stay wet on the surface and smother and turn the grass yellow. When chopped into small pieces by way of a fairly frequent cut the mowings add back organic matter and recycle nutrition and in consequence maintains good colour and more drought resistance. Much less fertiliser is needed and for Cathi none at all. The real beauty of scatter is it’s very much quicker. On the downside you will not get such beautiful stripes. A problem on turf is ‘thatch’ which brings an almost impenetrable surface if you try to stick in a spade. Made up of un-decayed rhizomes and stem bases it can be a real problem needing spiking and slitting. I will return to this in a later post but as far as I know this is not related to letting mowings fly. It is my intention to offer several posts about turf this year continuing the story….. 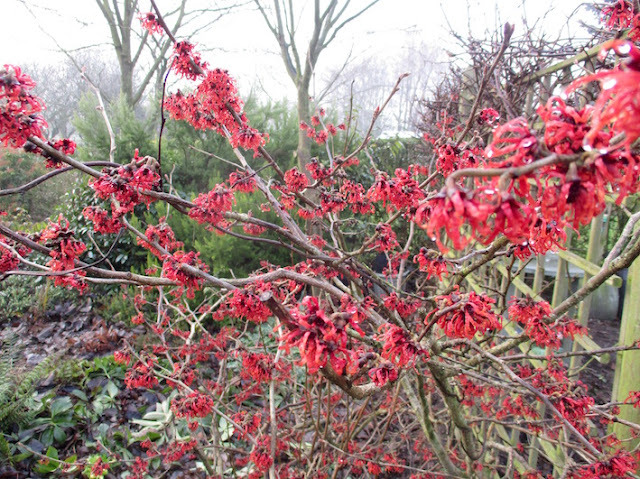 If you are a regular reader of The No Dig Gardener you will have realised the enormous depth and breadth of Roger’s gardening expertise. You might be also impressed by the trouble he takes to research both traditional and novel gardening activities and by his ability to formulate and present insightful comments. You might however, have noticed one rather glaring omission. There has never been a post on composting. The reason is simple. Roger does not compost. You may well ask, but I couldn’t possibly comment upon what Roger actually does with all the grass he cuts, the prunings he removes, and the vast amount of dead plant material generated annually by his herbaceous borders and strange vegetable garden. All I know is that it never appears on a compost heap – Composting at Roger’s is even rarer that digging! Despite the mystery that surrounds composting and the production of the perfect ‘crumbly compost’, the basic principle is really quite simple – make your surplus vegetation into a pile and let it rot. Composting is the decomposition of organic matter by soil organisms and is an essential component of the recycling of nutrients in ecosystems. Organic matter is the general term for plant, animal and microbial debris. Soil organisms attack organic matter to obtain the energy they need to live and the raw materials they need grow and reproduce. In other words, organic matter is the ‘food’ of the soil organisms. Soil organisms belong to very diverse groups - the microflora includes, bacteria, fungi and protozoa and the microfauna includes numerous arthropods, nematodes and diverse other groups of invertebrates. In some composting systems, earthworms and other relatively large members of the macro-fauna play an important role in pre-digesting and mixing the organic material with the soil particles. Collectively soil organisms can eventually break down virtually all types of organic matter but the rate of decomposition, and the nature of the end product, depends upon a number of factors. 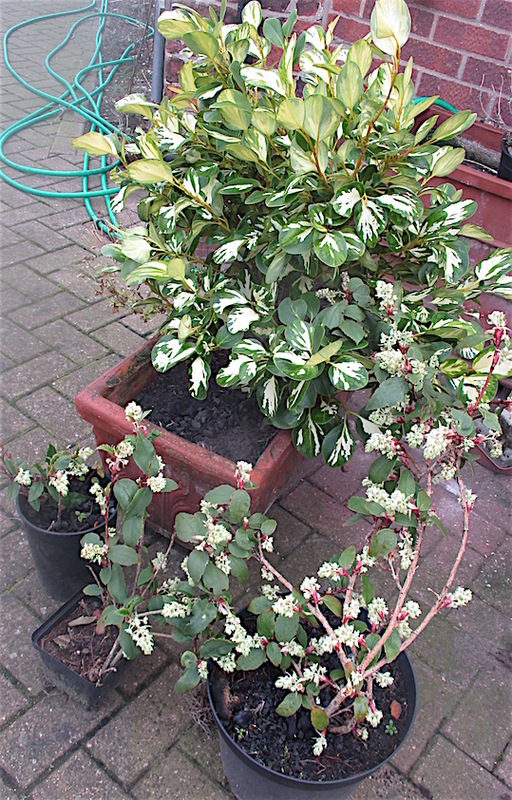 In this article I hope to discuss some of these factors and to simplify issues that television gardeners do their best to complicate or confuse. At the outset however, you can be reassured that whatever composting techniques you adopt, or even if you do nothing with your dead plant material, you will ultimately produce some sort of ‘compost’ that will be of use in the garden. 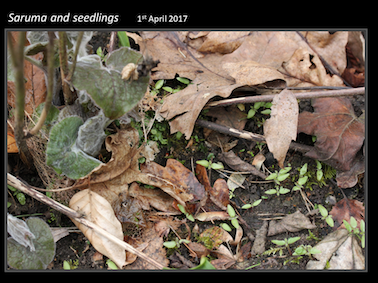 If you look at your garden in late winter or spring you will see partially decomposed plant material lying on the surface of the soil. The magnolia leaf below shows decomposition in practice. The easily decomposable ‘soft’ tissues of the leaf lamina have largely disappeared whilst the much more resistant water and sugar conducting elements remain. 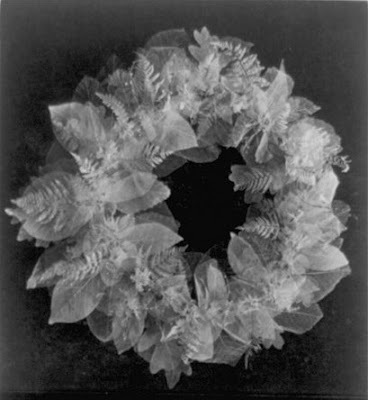 Victorian artists used various techniques to produce leaf skeletons for use as decoration. They usually heated leaves with a variety of caustic agents before bleaching the resistant skeletons and arranging artistically. As decomposition proceeds, some organic compounds are broken down rapidly and completely, resulting in the release of inorganic substances in a process termed mineralisation Many of the materials released from the organic matter in this way are essential plant nutrients. Resistant organic compounds and partially decomposed organic matter are more difficult for the soil organisms to mineralise and become converted into stabilised organic compounds that contributes to the humus fraction of the soil. (You might have noticed that Roger has written frequently, and at length, about humus and you might be relieved to know that I do not intend to do the same!). Stabilised organic compounds are effectively, natural, very slow-release fertilisers that take months, years or decades to fully decompose and release their plant nutrients. It is these stabilised organic compounds that are the basis of good compost and good soil. 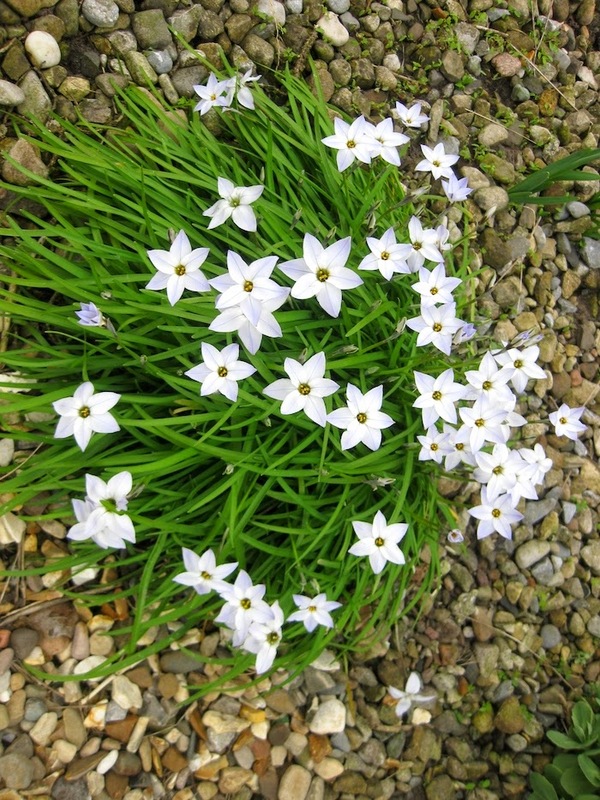 Whilst they supply plant nutrients only very slowly, and in relatively small quantities, their real importance lies in their ability to improve the physical properties of the soil by enhancing its structure and hence aeration, drainage and water holding capacity. Humus also greatly increases a soils ability to hold on to the mineral nutrients released during decomposition, or added in fertilisers, so that they remain available for plant growth. 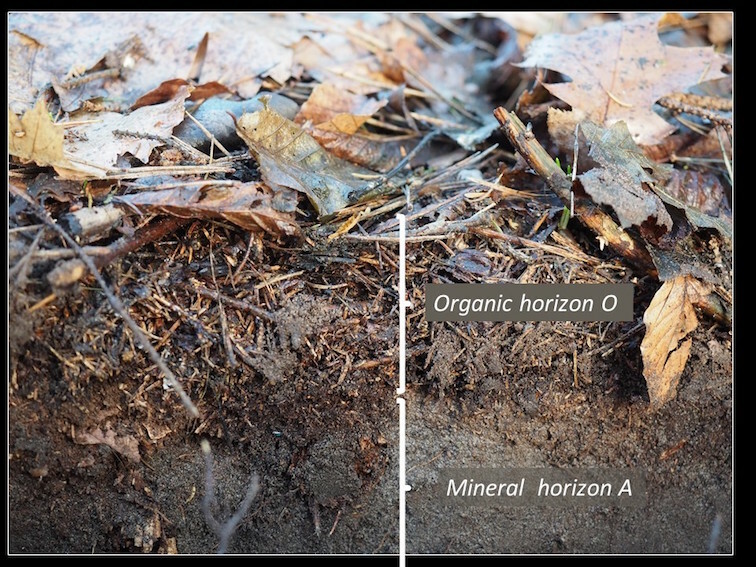 The surface of an undisturbed woodland soil has a deep layer of organic matter. Freshly deposited and partially decomposed leaves lie on the surface. Beneath, is the crumbly leaf mould that has the wonderful ‘earthy’ smell and is in effect, a complex mixture of plant and microbial residues and intermediate products of decomposition. The uppermost layer of a soil is the O or organic horizon that text books refer to. The layer beneath this represents the A horizon where the soil particles and organic matter are mixed and this is the most fertile region of the soil. 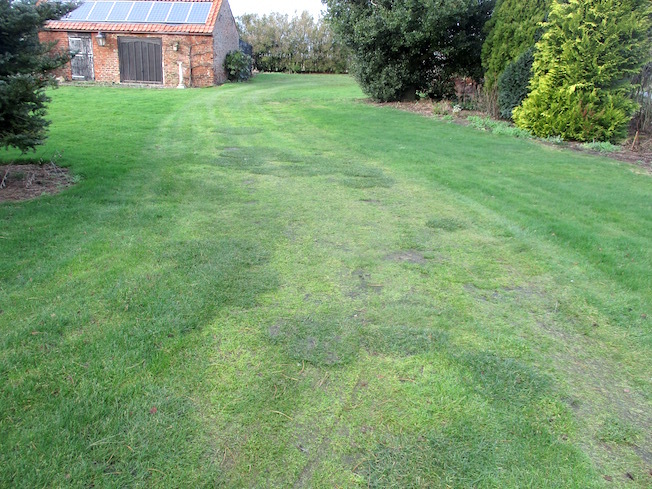 In permanent grassland habitats the organic layer is represented by the thatch between the soil and the growing shoots of the grasses and it is this layer that gardeners are so very keen to remove from their pristine lawns. 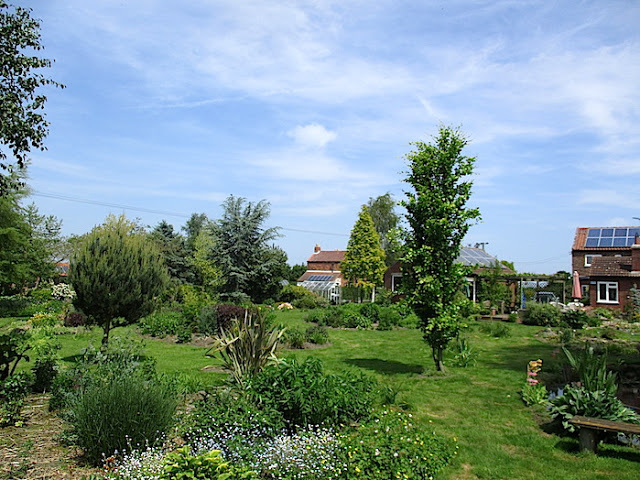 In garden or field soils, the O horizon is absent because it has been thoroughly mixed into the A horizon by cultivation (However, this may not be the case on the No Dig Gardener’s plot!). Lower layers (B horizon) are effectively the sub-soil where root growth is relatively poor. Organic matter enters the soil throughout the year but there is a great increase in deposition in autumn when deciduous plants shed their leaves and annual plants die. The processes that operate in the surface layers of soils are fairly slow and predominantly aerobic in nature. The ideal compost heap should work in essentially the same manner as the organic layer in a woodland soil, but because considerably greater amounts of organic matter are added over a short time period, and in a confined space, there are important differences. At this point the distinction must be made between ‘hot’ and ‘cold’ composting. Hot composting is the only kind that I use. It involves constructing a heap on a single occasion from previously stored organic materials (grass clippings, leaves and other plant remains) and aims to induce a rapid aerobic decomposition of organic matter that liberates heat that kills weed seeds, pests and pathogens. The process is completed in a matter of weeks or months. Cold composting involves serial additions of organic material over a period of weeks, months or years. This is essentially a slower, largely anaerobic process in which no noticeable heat is generated and the production of a crumbly final product may take years, or may not occur at all. Another really important consideration is the rational for composting. Whilst I use hot composting to dispose of waste materials, my principal aim is the production of a very desirable end-product that I use for mulching and in potting substrates. Cold composting is essentially a waste disposal system and the ubiquitous plastic compost bin typically used by many households is used to this end. In this type of cold composting, all manner of organic material, including kitchen waste, is essentially ‘binned’ in the hope that something ‘good’ may be formed in the bottom of the container. In my experience this is more likely to result in the owner finding a family of well-nourished rats than a supply of valuable compost. We are fortunate to have a local council that operate a recycling scheme. All plant and food remains are collected every two weeks and processed in an efficient, industrial, anaerobic composting facility. The end product is sterile, finely sieved, useful organic material that is offered to gardeners and growers either free or at very small cost. All my food waste and weeds are disposed of in this way and none enters my compost heap. 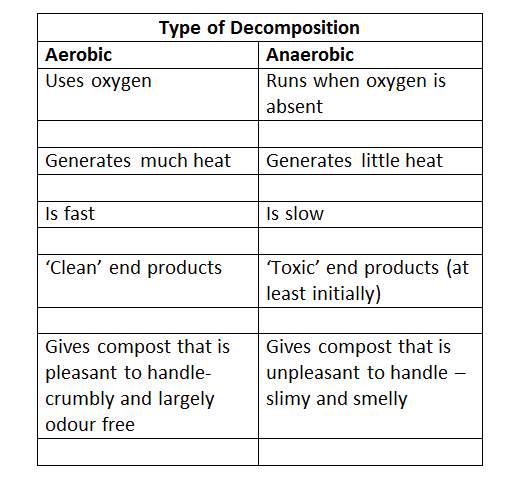 a) Although the details in the table above are generally true, the real situation is far more complex because of the many micro-environments that occur in a compost heap. Most of the microbes that decompose aerobically, can also do so anaerobically if the oxygen levels become lowered so there will be some anerobic processes in a hot heap and some aerobic ones in a cold heap. Factors that favour rapid decomposition include a lightly constructed heap that is porous to air and water and contains material with an appropriate carbon to nitrogen ratio. The ideal carbon:nitrogen ratio for compost is about 28C:1N. At this ratio, about three quarters of the carbon is used as an energy source and mineralised, and the remaining carbon and nitrogen is converted to make new soil organisms. This is exactly how humans and other animals use food both for energy and for raw materials for growth. Walter de la Mere clearly understood this and wrote in the first part of his humorous poem Miss T.
“It's a very odd thing - As odd can be - That whatever Miss T eats Turns into Miss T "
The same goes for soil organisms – much of what you put onto your heap essentially turns into soil organisms, at least in the first instance. Whilst it may be satisfying to know about C:N ratios all you really need to know is that living ‘green’ materials tend to have narrow C:N ratios and dead dry matter like grass, woody materials and old leaves have wide ratios. Most ‘equalish’ mixtures of green and brown material will decompose rapidly. If the C:N ratio of the materials in the heap is wide i.e. significantly greater than 35:1, there are probably plenty of carbon-rich materials that could provide energy for the soil organisms but a relative shortage of nitrogen-rich materials that are needed for protein manufacture and population growth of soil organisms. The practice often advocated by television gardeners of adding lots of cardboard to compost heaps “to feed the microbes” is one that I would never contemplate. This material has a very wide C:N ratio (perhaps 200 to 500:1) and in almost all cases reduces the rate of decomposition unless additional narrow C:N compost accelerators are also added. If the C:N ratio of your compost heap is narrow, i.e. less than approximately 20:1, there will still be plenty of carbon rich compounds to provide energy but a relative over provision of nitrogenous compounds. Decomposition proceeds rapidly and the surplus nitrogenous compounds may be released to the atmosphere as ammonia. This explains why there is often a smell of ammonia around used bedding straw removed from animal pens – Animal wastes have a narrow C;N ratio (10-15:1) because animal urine is very rich in nitrogenous compounds and this is why old and not so old, gardeners frequently urinate on their compost heaps! The factor most often overlooked by television gardeners and magazine articles is the need for the compost material to be wet. Dry heaps will not decompose rapidly however favourable the C:N ratio and other factors. I make use of this fact throughout the grass cutting season. All my mowings are simply dumped in a containing area and left until autumn/winter when I construct my heap. The heap is not covered to exclude rain but even so, the contents remains too dry for rapid or prolonged decomposition to occur. 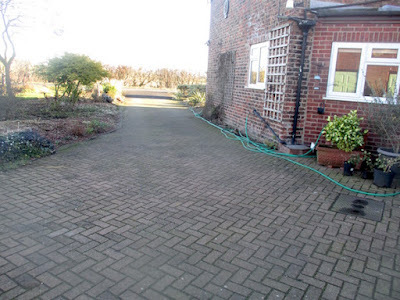 A pile of grass clippings collected over a period of weeks or months might well appear damp at the surface, but if the outer layer is removed, the older material will appear dry and grey coloured. The colouration is due to fungal mycelium that has initially used any moisture present to start decomposition - the C:N ratio of fresh grass is narrow and decomposition rates are potentially very high, but rapidly become limited by lack of water. The dry, partially decomposed grass still contains large amounts of energy that is responsible for the generation of heat in my composting process but it is highly water repellant and difficult to re-wet. In composting size really does matter – small heaps are less likely to heat up and retain their heat for long enough for effective decomposition to take place. 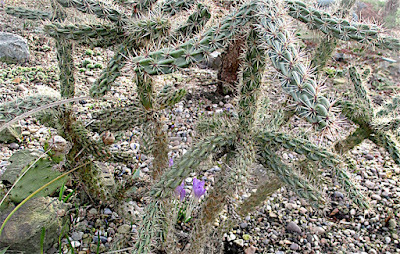 In addition, the lack of heat means that potential pests, pathogens and weed seeds will remain. The reason is the relationship between surface area and volume. Small heaps – the size offered by commercial plastic compost bins – have a large surface area to volume ratio. 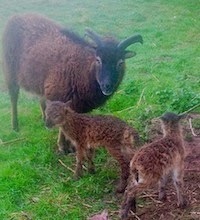 This means that they are prone to loosing heat quickly and do not get hot unless they are well insulated. Failure to generate and store heat, prevents those microbes that require high temperatures from growing. 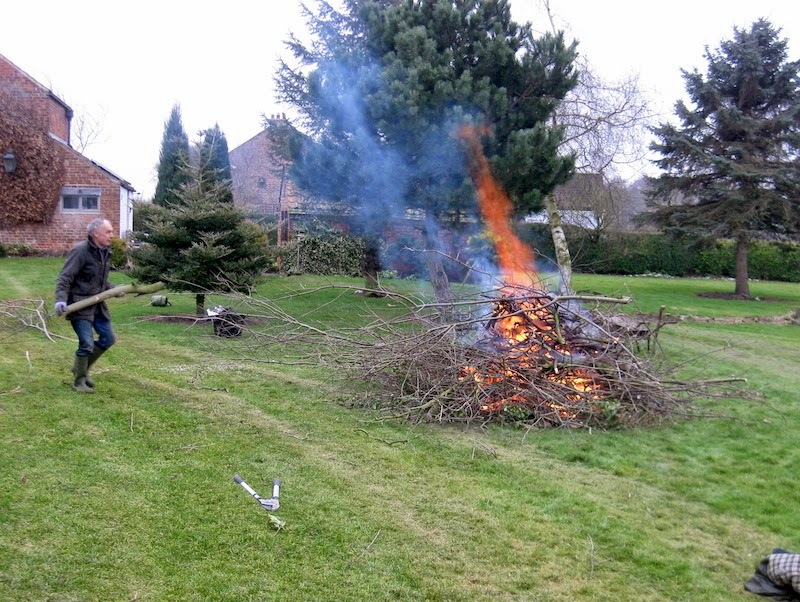 Larger heaps are far better at reducing heat loss and the ideal size is probably of the order if 1-5 cubic metres. Even larger heaps may suffer from the problem of becoming anaerobic because diffusion of oxygen is impaired and cannot enter fast enough when decomposition is at the highest rate. The surface area of the material on the heap will affect how rapidly it decomposes and the smaller, the better. This is the surface area effect mentioned above. Again here, the smaller the pieces, the bigger the surface area but this time a large surface to volume ratio is favourable because it enhances the rate of decomposition. 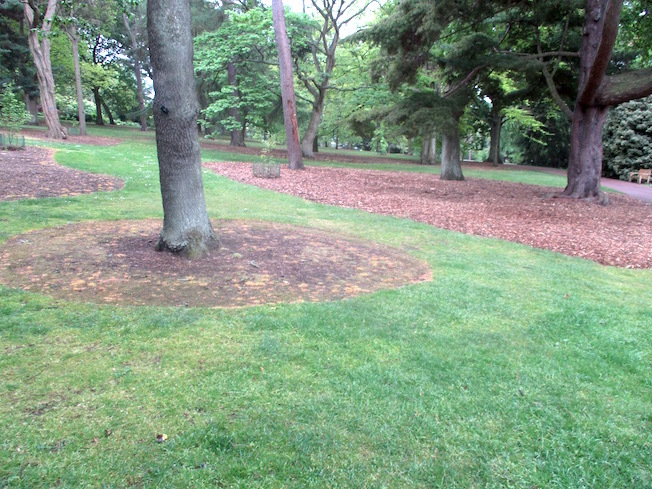 Since the majority of my material is grass clippings leaves and small branchlets blown out of deciduous and coniferous trees and collected via a rotary mower – no further treatment is needed. 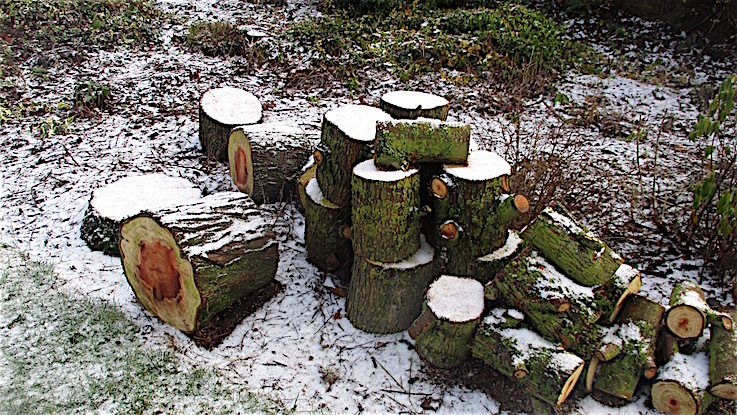 If you have generally leafy or woody material it would help to crudely chop, mow or shred before composting. I have never bothered to check the pH of my compost although all my plant material comes from vegetation growing on a very acid soil with pH 5.5. In terms of aeration, I load my heaps simply by forking the stored grass etc into the composting bay and only gently firming down – usually with the fork, or at the end by walking on the surface. This system worked well but I later split the large bay to allow me to store leaves on their own, to make ‘pure’ leaf mould. I succeeded in making leaf mould but the rate of decomposition was so slow that it took over two years to complete. I am not sure that pure leaf mould is as good as my mixed compost and I will not repeat the process. I usually start sometime after the middle of November when a substantial volume of leaf material is available. 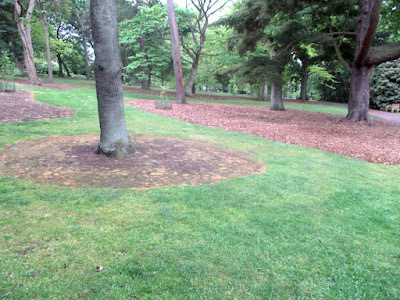 The first layer is usually composed of fresh grass and fallen leaves. Collecting the leaves together with fresh grass using a rotary mower is helpful because it thoroughly mixes the two components. If I start later as I did this year when grass mowing has finished for winter, I toss in about 15 cm of ‘old grass clippings’ and then about the same volume of leaves and gently mix the two together with a fork. Every 30 centimetres I water the mixture thoroughly. In practice I just leave the hose pipe running continuously when I am adding the components and keep moving the hose pipe about in the bay. I repeat the process until the bin is full – usually a couple of hours or so. I give the completed heap a final watering and then cover with a layer of dry leaves for insulation and then just leave it. To record the temperature change I insert a thermometer on a short length of fine zinc coated wire and position the bulb 30 cm beneath the surface. 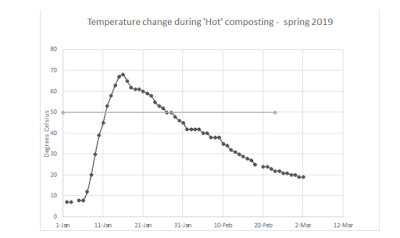 The results for this year’s composting that started in January 2019, with plant material stored during 2018 is shown below. 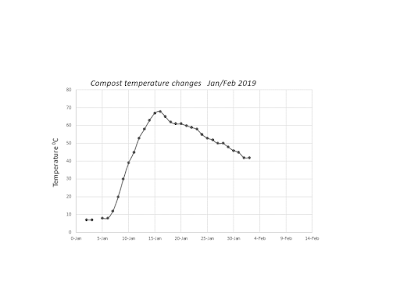 The heap was completed on the 5th of January 2019 and the temperatures shown for the few days before this were from the stored grass cuttings. The plotted results are similar to ones that I normally observe. The temperature rises after just a day and then accelerates to reach a maximum in the high 60’s C. The highest temperature that I have ever recorded was 72C. 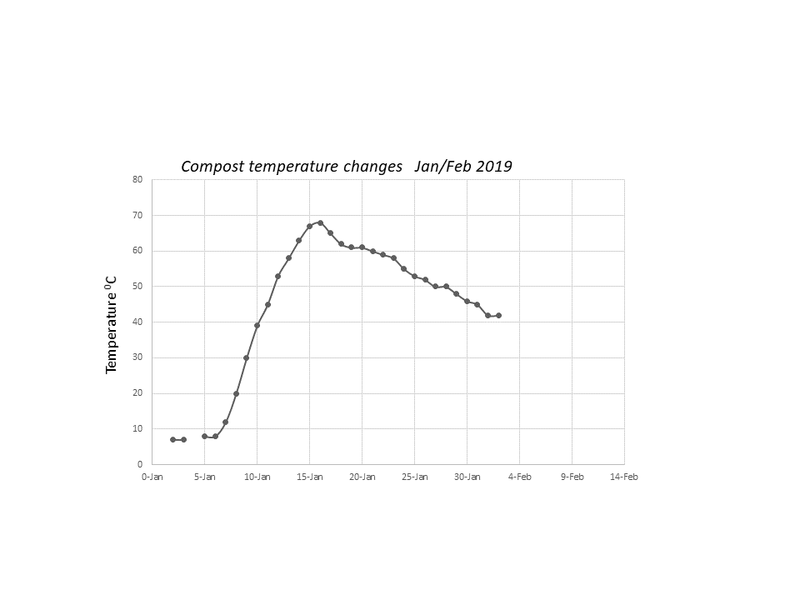 A temperature of 50C or higher, is usually suggested to be necessary to kill pathogens, pests and weed seeds and as the graph shows was maintained for 16 days. The average outside air temperature during this period (January 2019) was approximately 3C with frequent night frosts. In late January, night temperatures were of the order -5 to -8C and day temperatures rarely rose above freezing point. Microbial populations will change dynamically as the compost ages. Even after the temperature falls back to near ambient, the microbial processes will continue slowly. At the time when the heap is at its highest temperature the predominant organisms are likely be the fascinating aerobic thermophilic bacteria that have an optimum temperature around 50-60 C. When you consider that it is very unpleasant/harmful to immerse your hand in water at 50 C for more than a few seconds you can realise just how hot this is. As decomposition occurs and the temperature rises, the volume of the heap decreases. After three weeks the volume had decreased by 25%. Past experience suggests that the volume will further decrease slowly over the next two or three months before I use the material. At this time the volume is usually approximately 50-60% of that at the start. In years when I start composting early, or where I have a large surplus of material, I top up the heap with fresh material after about three or four weeks. I do not ‘turn’ my compost heap at any stage – I set it going and simple use the end product. Turning may be helpful to mix up, and re-aerate and possibly re-hydrate the decomposing mass, but it is very hard work and with my size of compost bins, not needed. 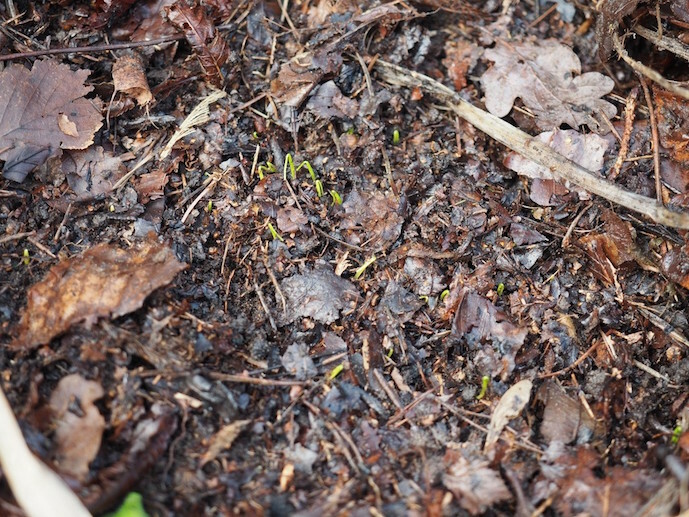 I generally begin to use the compost in spring – four to five months after the process was started. The surface layer is removed and stored for future composting because it has undergone only minimal decomposition. 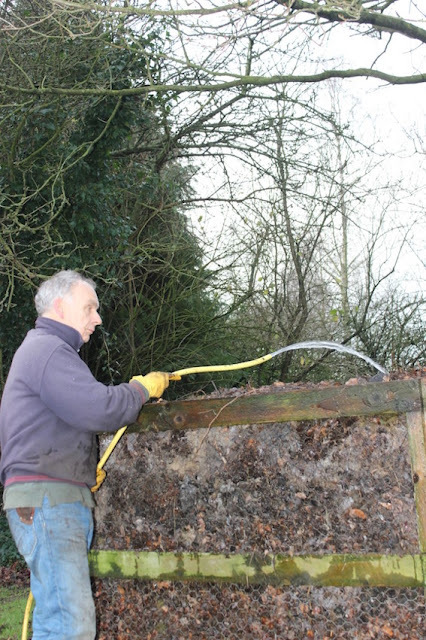 The main body of compost is damp but virtually odourless and relatively easy to remove with a fork. For mulching I simply transfer to a wheel barrow and chop coarsely with a spade before depositing in a 10cm layer over clean, bare soil. Plants respond well to the addition of compost but the main reason I use it is not to reduce water loss as usually advocated, but to suppress annual weed seedlings which it does remarkably well. In addition to weed suppression, there may be numerous other benefits from a layer of organic compost, possibly including increased water availability. However, I have frequently noticed that the soil beneath the organic mulch becomes very dry. Because the organic material holds water strongly, little water gets through to re-wet the soil unless rainfall is heavy and prolonged. I am therefore a little dubious about the effectiveness of organic mulch as a method for increasing water availability in the short term. In beds mulched on a regular basis, I have noticed that shrub and tree roots begin to grow in the mulched layer and at this time they may get an enhanced water supply. I have observed on every occasion when I have stored compost in my polytunnel for a period of a year or so, that roots from the trees adjacent to the tunnel invariably invade the heap and grow throughout it very actively. The second principal use for my compost is in making potting media. For this activity I transfer the compost to my polytunnel and roughly rake into a bed approximately 20cm deep. After two or three weeks I make into a pile and sieve the material through a large coarse sieve made to fit over a wheelbarrow and then it is stored either in a pile, or in 120 litre containers. In the dried, sieved material, remains of the grass and leaves can still be seen, but this is quite resistant to further rapid breakdown and maintains its structural integrity well. However, potting media made with a high proportion of compost does tend to shrink a little over a period of a year or so, much like most proprietary brands of multipurpose. I normally mix my compost with stored garden soil and gravel or Perlite. The proportions vary depending on what I am growing but usually it is 50% soil, 25% compost and 25% grit or Perlite. 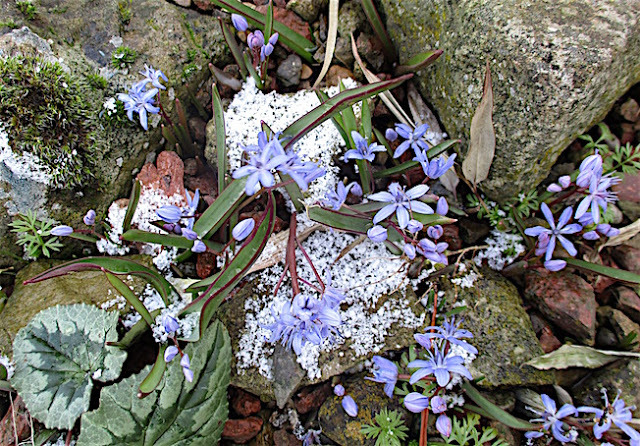 For woodland species I often omit the perlite or grit and perhaps use 60%soil, 40% compost. Hardy cyclamen and hepaticas do really well in this latter mixture. When making potting compost for especially valuable plants the soil I use is derived from stored grass turves that have rotted down over a period of a three years. This was the original basis of John Innes compost but I doubt that much if any commercial compost uses stored turves today. For many years I was rather like Roger and was in denial about composting. I simply dumped lawn cuttings and other materials on an ‘out of sight’ area and allowed it to ‘disappear’ naturally or put it on a bonfire. 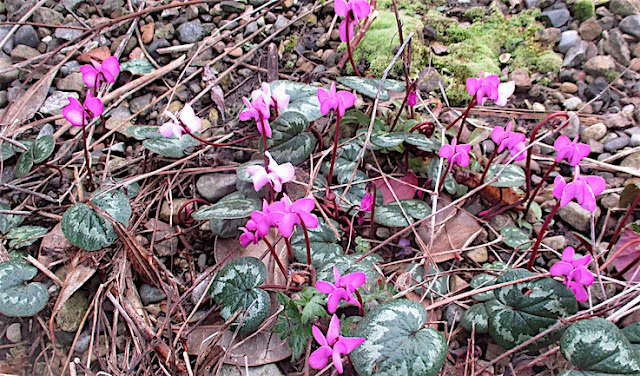 When I did collect leaves, I returned them to the wooded area of our garden. My concern about composting was that the result of my unsatisfactory efforts with plastic compost bins. I never produced useful compost and usually ended up with wet, sticky, and rather unpleasant material. This was probably because I did not think about the process carefully enough. 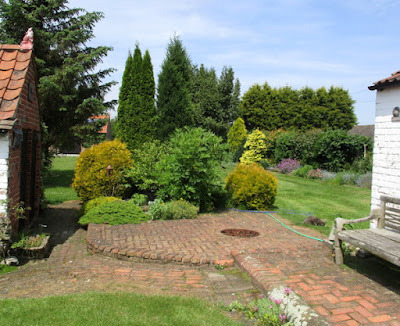 When we started opening our garden for charity events, I did not want visitors to see the scruffy area where I dumped waste vegetable matter so built the system that I now use. 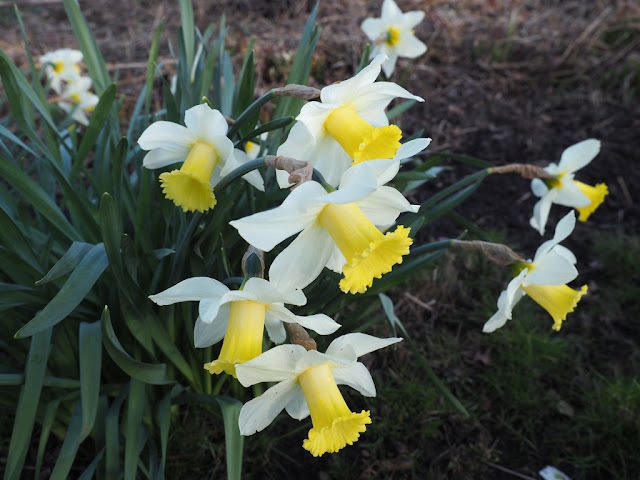 At first, I was very reluctant to spread my compost as mulch because I feared that it still might contain weed seeds that had not been killed, My worry was that I would effectively spread new weeds all around my generally weed free beds. Having started to use it however, I am now a total convert and produce as much as I can each year. I cannot make enough to mulch all beds each year so I use a rotational system. I felt similarly reluctant to make my own potting substrate because I did not have the facilities to sterilise the garden soil I was using. However, once again I am converted to this system. The results are excellent and, in many cases, far better than I obtained using compost bought from the local garden centre. A few weeds do pop up but they can be easily removed and I am not aware of increased problems from pests and diseases. Roger has used his garden soil as potting substrate for as long as I have known him and produces excellent results. However, I fear there is little chance of converting Roger to composting with a view to using it as mulch for weed control because of his attachment to, and skill with his herbicide sprayer.